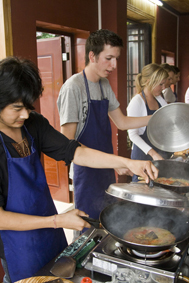 At the Yangshuo Cooking School we believe that one of the best aspects of travel is the food oftheregion you are in. By utilizing the knowledge, produce and ideas of local people we have designed week-long cooking experience that will introduce you, not only to the renowned Chinese cuisine but also to the techniques, history, culture and varieties of cooking that exist in Chinese food and cooking. We do this, in arguably, one of the most beautiful and accessible places in Southern China; the rice-growing heartland of Yangshuo, Guilin. Eulogised by poets for over one thousand years, surrounding by countless limestone karst peaks and bamboo-lined rivers, this is an idyllic and relaxed setting for a week of learning about the Chinese culture of food. This course is for those that are passionate about eating great food, making great food and of course … having some fun along the way! Our classes are set in a renovated mud brick, courtyard home set amongst rice fields, shaded by citrus trees, in a small village just a few kilometres from town. Come and join us toexperience a very real slice of China in a beautiful and relaxed setting. Classes will be hands-on and will be in a relaxed atmosphere in our specially designed kitchen in our mudbrick courtyard house. Classes will be held every morning with the results being enjoyed for lunch. We are offering this week long course on four dates during 2014. If you have a group of people then we are happy to discuss other dates. Airport transfers from/to Guilin International Airport. For accompanying partner who is not cooking please enquire about price. For those who would prefer to live in the village there is rustic but comfortable accommodation at the Outside Inn. Deduct $US250 per person. A 50% deposit (non-refundable) is required to confirm booking with the balance due 60 days before the course. More Information > Details about One Week Course. For reservations check the 'Contact Us Page'. We take bookings up until 6pm on the evening before classes.